I was watching a short piece by Adam Frost on Gardener’s World, having just fixed up a visit to Leeds for a few days, when I heard him say that York Gate was in Leeds, not York as I had dimly imagined without checking. To cut a long story short, on a cold afternoon with sunny breaks this week, I found myself in York Gate Garden in Leeds- a garden that I have always wanted to visit. Brilliant. This is not a grand or massive garden- but it is a garden gardened beautifully with real attention to detail and designed by the family who owned it until the 1990s with a lovely mix of quirkiness and boldness. Take the opening photograph. Ignore the superb spikey shapes top left, and what you can see is a shape redolent of Edwardian or Arts and Crafts gardens, a lozenge-shaped pool, with off-centre plinths, on one of which is a darkly painted planting urn of the period, neatly edged gravel paths and sweeping shapes. The planting has all of the expected Spring plants that are quintessentially English in style- but looking closely, there are already planting gems, such as this stunning narcissus below. From afar, what looked like daffodils massed in the borders, but this were a lovely surprise. No idea as to variety, and only the stems and leaves say ‘narcissus’ to me, but the flower is creamy yellow something else. Robin Spencer made the Arbour from recycled wooden beams from a fire-damaged chapel at Armley, and the wooden beams sit on chunky stone legs, very Lutyens- like in their stockiness and practicality. Close to the Arbour is a woodland area with water from the lozenge-shaped pool trickling through it- I am not a trillium expert as you might imagine, but the red buds rising up from silvered foliage looked magical in the partial sunlight. Looking fragile without leaves, the Nutwalk nevertheless must be pretty tough to take the Yorkshire winds, hazels can take a lot. Underneath their slender stems, masses of brilliant red tulips had been planted. 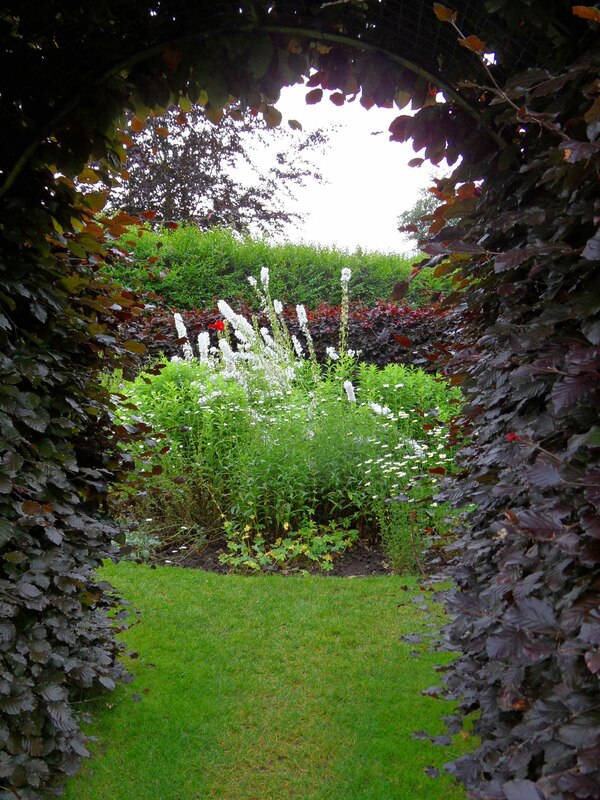 The Spencers knew a thing or two about light in the garden- all the paths are angled to make the most of the sloping situation of the garden. The tulips were shining like stained glass in the fractured sunlight that afternoon. A touch of William Morris here in the beautifully constructed path leading to the Perfect Pot at the top. Fringed by dark and mysterious Ophiopogon planiscapus Nigrescens, the path glitters in the light, bordering the borders filled with spring and summer perennials and bulbs. The Perfect Pot provides the focal point, simply placed on a gravel round edged with stone pavers. Look at the precision of the topiary, and then also at the distance and perspective that the shapes create- and then think about how long-lasting this vista is. All year round shape and interest. I am a straggly gardener, but even I love the clarity of these shapes and also the slightly surreal atmosphere that they create. And the Perfect Pot stars in the far distance. More of York Gate to follow. I am always behind when it comes to ‘Days’- like International Women’s Day. So, here I am, several days late. But I enjoyed seeing what ‘Ali, The Mindful Gardener’ and my gardening writer friend, Sarah Salway, had to say on Facebook, and thought ‘Why not list my five favourite women garden writers and books?’. All my book links are to Abebooks.co.uk- on the grounds that homes are needed for more used and secondhand books. Her gently ascerbic tone is a delight of under-statement, and she never shirks from talking about her mistakes and her learning, whilst retaining a good dose of laughter about how she, and Walter, make it through the arguments and lectures. 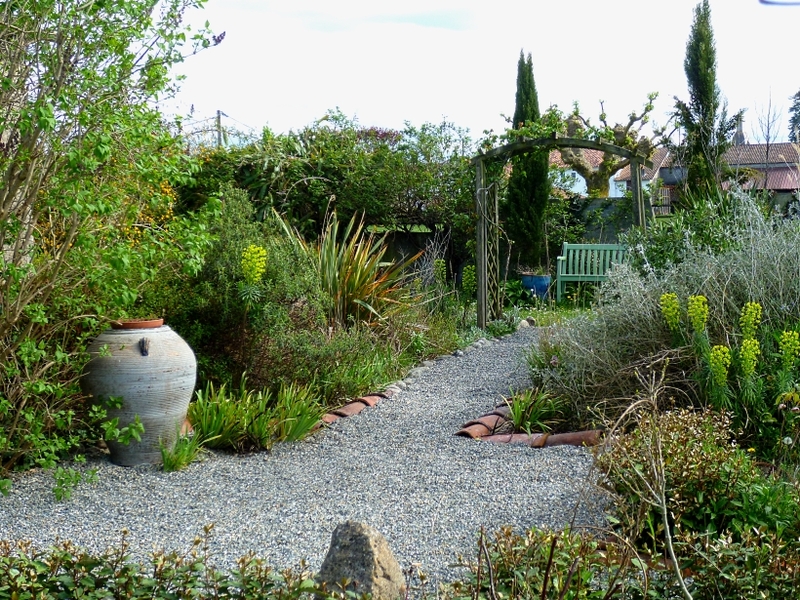 Along the way, there are invaluable lessons for any maker of gardens- and her garden remains a much loved and inspirational space which I would love to visit. This is the book I have most often bought for women friends who love gardening. I bought this book not long after we had moved to France, and, although my garden, as I was to learn, could not host many of the luscious plants that Sarah describes in her book, I was absolutely set on fire by her use of colour and mixtures of colour- as well as her boundless enthusiasm for the plants that she is writing about. Jonathon Buckley’s photographs are almost edible they are so good, fresh and exciting. Christopher Lloyd’s foreword sums up her approach and, of course, she has learnt so much from him I think. A shout-out also for her beautiful compilation and authored book on Vita Sackville-West and Sissinghurst, ‘Vita Sackville-West and the creation of a garden’, which I really enjoyed after visiting Sissinghurst for the first time this year. I love this little book. It is a modest and utterly engaging book about Geraldene Holt, the well-known cookery writer, and her restoration of an ancient walled garden in the tiny village of Saint-Montan, in the French Ardèche. It was the book that inspired me the most in developing village contacts here when we moved, and over the years, gradually finding a role, which I would never have imagined, as the co-ordinator of a group of committed gardening people, who are gradually softening the edges of our village with sustainable planting- and having a lot of fun as well. Her own garden lives on, now run by a local Association, much like ours I imagine, and is definitely somewhere I want to visit. I know what she means. Beth Chatto is such a hero- quietly determined, delicate and yet robust, and so much a real pioneer entirely on her own terms. Her book ‘Beth Chatto’s Gravel Garden’ was like a Bible to me when I first realised that I couldn’t imagine Tostat as being a slightly hotter Surrey, where I had my very first garden in my early 30s. Turning her carpark into a dry garden, as she did, with no irrigation at all, was a vital experiment for the time. She has a love for the unorthodox, which broke new ground then, seahollies, prickly thistles, felted plants and wild Verbascum. She is, above all, a calm observer of the garden that she is creating- and now, after nearly 15 years, I am almost able to do that too in my own garden. Nora Harlow has done a great job at pulling together the strengths and a shared philosophy behind this big book, which is really designed to encourage residents of the East Bay Area, in San Francisco, to abandon water-hungry garden spaces and embrace a different aesthetic. The book reads easily, pithily and the message pulls no punches. What’s more, the philosophy is incredibly helped by the sensitive and compelling photography of Saxon Holt. Two thirds of the book is a compendium of plants, trees and shrubs that actually welcome summer-dry gardening by having growth patterns outside of the hot, dry period, and many of them are entirely dormant during the summer. So, shifting the aesthetic needs to be as much about embracing winter-autumn-spring as the main seasons of interest, and learning to love the dried-out looks and shapes of the summer. What a bold move for a Utility Company. How’s this for inspiration? Two recent cold weather reading bouts brought me back to the hours spent at Sissinghurst at the end of June. 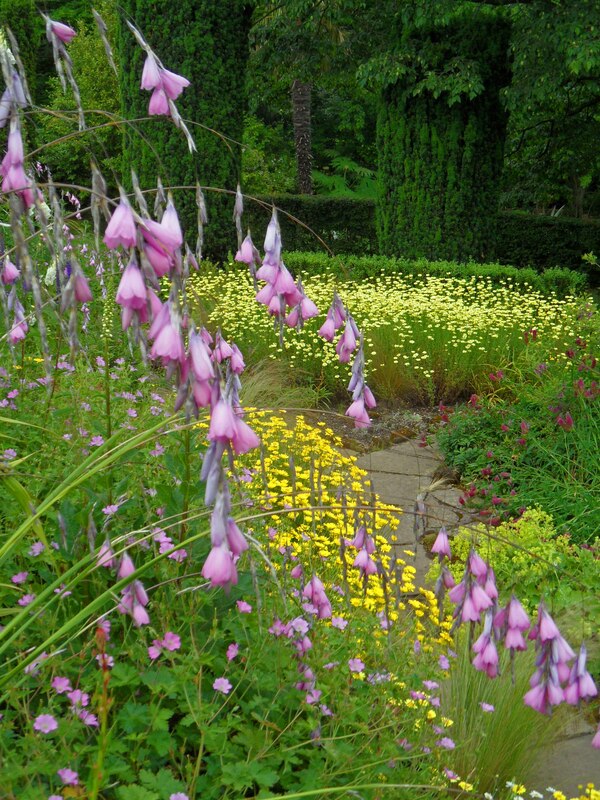 There is always the risk that an iconic garden can be overwhelming, disappointing or even just too hard to take in because it is so heavily visited. There was an element of the first two possibilities in my experience, but, actually, I was not disappointed. I realise now, looking back, that I didn’t get to grips with Harold Nicholson’s clever and thoughtful structural elements, and that I wandered, in a rather delirious fashion, round the garden without much order or thought. So, remembering what was where required a lot of post-visit referencing of the garden map and descriptions. So, is there a problem with garden delirium? Actually, I don’t think so. I do have in my mind the sense of joyful chaos, of generous planting, the excitement of meeting plants that I didn’t know, and then had to try and identify later. I did really love the hovering sense of Vita in her garden, even down to the slightly artful arrangements of tools and equipment that had been placed so well to give the sense of a working garden. 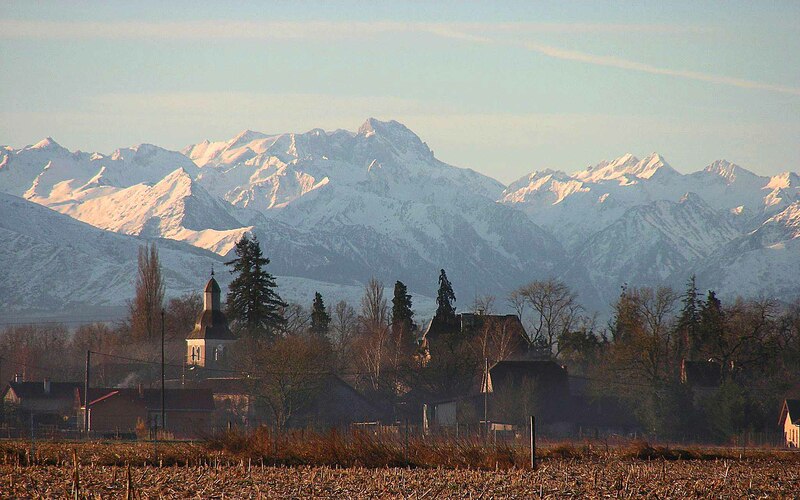 So, probably that feeling of the love and absorption that Vita gave the garden and the place is one of the most important things to take away. But back to the reading episodes- one, a book, the other, an article. I had seen in the NT bookshop, the book written and compiled by Sarah Raven about Vita and her garden. I confess to later buying it in pristine condition and half the price from Abebooks. I really enjoyed it. No silly worshipping here, good, honest information and a really solid compilation of Vita’s writings about her gardening habits and practices- and an abundant sense of the garden as it is now, a mixture of history, Vita and those modern gardeners who have championed the garden since her death. I really recommend this book. And then secondly and by pure chance, as I always check the Tory press, so important to know what the opposition is doing I reckon- a really good and interesting article 2 days ago, sadly in the luxury section of the Telegraph online. When I look at my photographs, only a few managed to reach into the garden. This is a visitor-numbers issue. It was almost impossible to draw breath or take a photograph in the White Garden for example- not that people were jostling, just the amount of movement around you made it really hard to concentrate at all. I only have hazy memories of the White Garden. So, I took the photographs that I could rather than the ones I wanted. Ah well. There were some truly gorgeous plants as you would expect. I have talked about the roses and some of the plants in two earlier posts, here and here, but here are some photos and links for some of the plants I have managed to identify. Happy hunting. This new border, which I planted up this Spring, has saved my sanity this summer- well, almost. There must be water under here, which I never noticed before as it used to be a jumble of messy shrubs- but water there is, throughout our burning temperatures, it has looked pretty much like this. This photo was taken yesterday after rain, so the greens are all refreshed, but the plants are in great shape. And I adore the self-sown wild carrot, which is frothing up at the back, so I have bought a packet of Daucus carota ‘Dara’ seed to amplify this effect myself next year with any luck. Monarda fistulosa has been torched in other parts of the garden but is still looking good here. And I will definitely be growing the annual purple millet again, it is fabulous- I may even go for broke and grow the super-tall one, Pennisetum glaucum ‘Purple Majesty’, which can get to 1.5m. It is super-easy from seed and then blows itself up in purple till the frosts see it off. Here is another bit that has done really well, although the Miscanthus is about 2/3 of the normal height. The Bupleurum fruticosum has really hit it’s stride this year and is an insect cafeteria complex all on it’s own. This plant is always a surprise, Platycodon grandiflorus ‘Fuji White’. It just soars above the rest of the planting undeterred, and is such a cool customer. Probably at it’s best in green surroundings, I love it. It is helped by the fact that there is running water nearby no doubt. A slightly breezy-looking Salvia ‘Didi’, only in it’s first year and so still quite small, is nevertheless quite delightful with delicate pink and light apricot colouring. Only about 10 cms high, yet this Gaillardia x grandiflora ‘Mesa Yellow’ really does work hard in very dry conditions. I managed to grow three decent plants from a small packet of seed last year, and I have really come to appreciate this plant, and will be growing more. I love this combination, and it is brought to life by the stray Rudbeckia. This is another really good shrub, Physocarpus opulifolius ‘Tiny Wine’, which I planted in last year and it has gone on and on, with tawny new growth that then colours up mauve or wine-coloured. The Sanguisorba menziesii was grown from seed about 4 years ago and is now a great big clump, which I always forget to prop up until it’s too late. And lastly, not out yet, but cheering me up, which has been the point of taking these photos really, (proving it’s not all burnt out there! ), are the architectural buds of Hibiscus palustris….to come. I visited Winterbourne House last June in a rainstorm- one with serious rain, requiring numerous dashes for cover. It was part of a day in Birmingham which was sort of accidental, but Winterbourne was really worth the afternoon. The House itself is a fascinating story of family philanthropy and vision in late nineteenth century industrial Birmingham, and the garden is a charming example of gardening in that period. It has a wonderful and immense Victorian rockery, a Lutyens-style massive pergola, an Oriental Valley with gunnera as it should be, and some charming border planting. The garden holds the National Collection of Anthemis and Iris unguicularis. 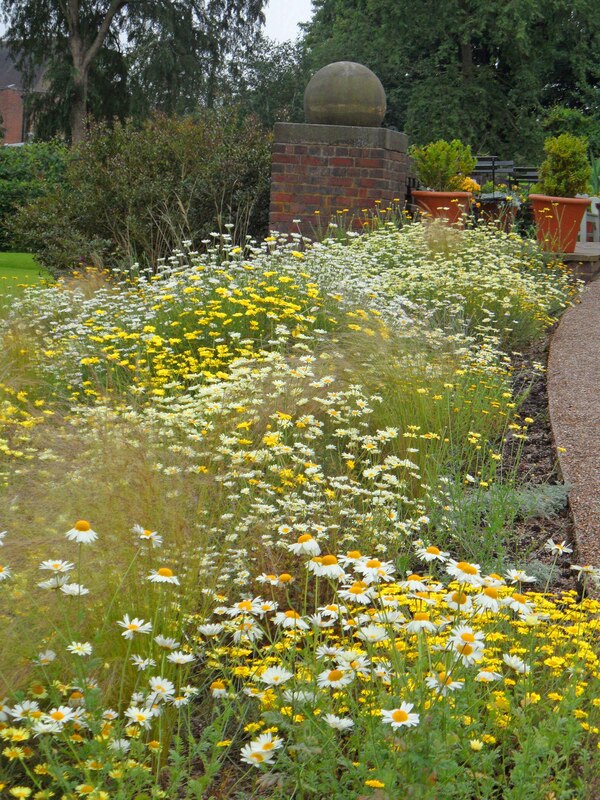 I have never seen massed plantings of Anthemis and I was there at just the right time, it woke me up to anthemis and summer daisies in general. The planting round the pergola was looking really bedragged, no surprise given the rain, but it all needed a bit more oomph to match the big, chunky pergola supports. I loved this view through the purple beech leaves. Nothing complicated, just a relaxed clump of white Veronicas, but a really good contrast with the beech. 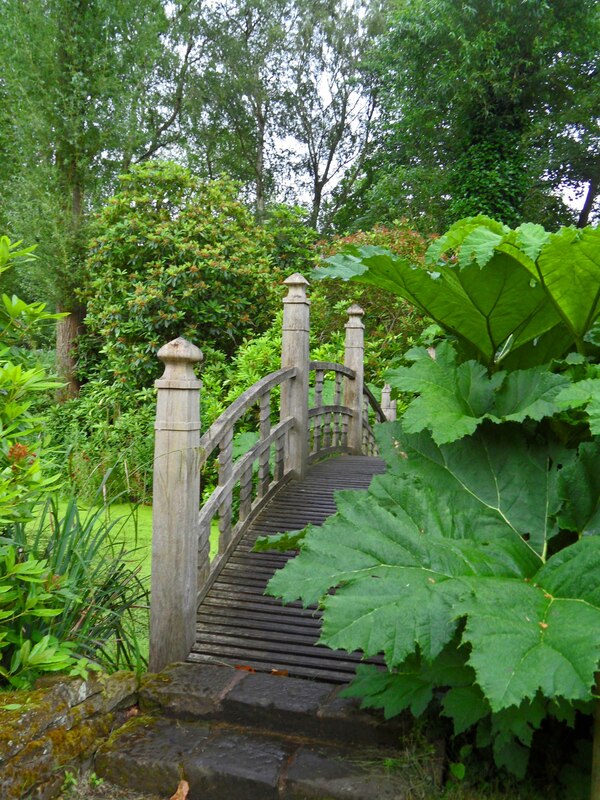 And in the Oriental Valley, a Japanese style bridge was almost besieged by the magnificent Gunnera manicata running wild in the rain. These Gunnera must have topped 3m, absolutely colossal.